Crate-diggers and vintage record fanatics of the 21st century, listen up - a never released soundtrack album from an ill-fated 1970's action flick, rediscovered earlier this year, will hit stores this summer. A spokesperson for media-shy jazz-funk outfit Cadillac Jones announced at a weekend press conference that the non- malicious mislabeling of the original tapes led to the soundtrack's estimated twenty-seven year disappearance. Feature film "The Big Takedown" was reportedly shelved by an unnamed major studio when producers exceeded their budget by twice the originally allotted amount and were, by all reports, nowhere near done with the picture. Attempts to raise additional capital failed and the plug was pulled on the project once and for all. "It was tough on the guys in Cadillac Jones as they'd put months into that record," said the spokesperson for the band, going on to say jokingly that "it was the '70s, you know, so it's all a bit blurry, but there was no shortage of parties and heaven knows what else, so we, you know, got on to other projects." Details on how the tapes resurfaced are vague, and the band's representative commented only that an old friend at the now-defunct studio found them in a box he carried out when the Hollywood powerhouse declared bankruptcy in 1982. (Although it gathered dust for close to three decades, it appears as though the soundtrack album was the only piece of "The Big Takedown" that was submitted on time). This same associate was able to guide Cadillac Jones through the process of buying back the rights to the album, which has finally, after some thirty years, been mixed and mastered. 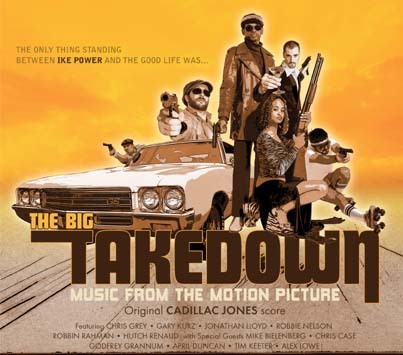 The only other trace of "The Big Takedown" to resurface is conceptual artwork by J. Schiavone, which will appear on the cover of the soundtrack release. Several of Schiavone's "Big Takedown"-related pieces were returned with the original recordings.